The New Orleans Hispanic Heritage Foundation (“NOHHF”) is a non-profit community organization whose main purpose is to provide an organized and directed effort in cultivating and promoting the Hispanic heritage of New Orleans and the Southern region. Each year the organization awards high school scholarships to talented Hispanic students at local schools participating in the program. The scholarships are given directly to participating schools to help individual Hispanic students who have financial need and a strong academic record. The annual Azúcar Ball is the organization's biggest fundraising event of the year. I created save the dates and formal invitations for the 2017 annual Azúcar Ball fundraising event. This year's theme was El Festival de las Flores, which means the festival of flowers. 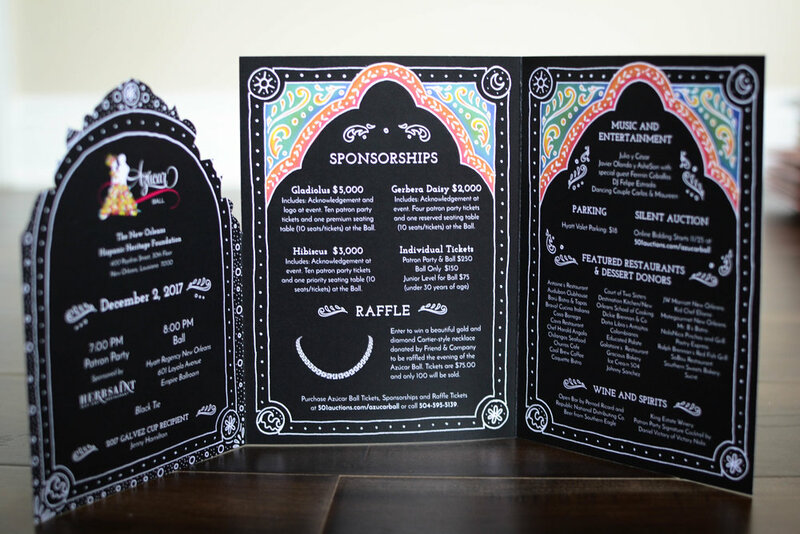 The invitation design was used through out the event to inspire decor and costumes.